including the ease with which many game the ones like The Wall Street Journal one. Now we have numbers which should come as a shock to no one, indicating that most tablet users do not want to pay for news. The source? “The Tablet Revolution and What it Means for the Future of News,” by the Pew Research Center’s Project for Excellence in Journalism in collaboration with The Economist Group. As you can see, the news is pretty popular in the world of tablet users. It beats out everything else — social media included — except general Web surfing as the single most popular use for the devices. This is rather significant, since tablets have gone from zero to 11 in no time: 11% of American adults now own and spend at least 90 minutes a day on them. With many media companies seriously looking at tablet-specific offerings this would seem like good news, however, this isn’t the case. 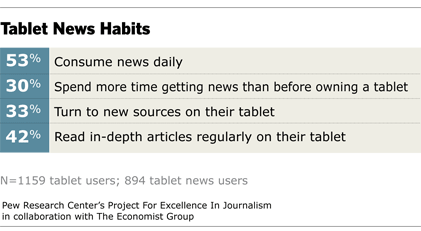 Even so, just 14 percent of those who consume news on tablets said they have paid for news content on their devices. Another 23 percent, though, pay for a print subscription that includes tablet content. So in all, about a third of tablet news consumers have paid to access news on their gadgets. ‘That is a much higher number than previous research has found more broadly of people paying for digital content,’ the report says. Nonetheless, a ‘large majority’ of people who have not paid for news are ‘reluctant to do so, even if that was the only way to get news from their favorite sources,’ the report adds. This is bad news for media companies hoping to boost revenue by charging for content on Apple Inc.’s iPad and other tablets. Of the people who have not paid directly to access news on their tablet, just 21 percent said they would spend $5 a month if that was the only way to access their favorite news outlet. Ouch, that has to sting! It’s certainly not news that those endorsing paywalls will enjoy hearing. But still, these are just numbers at this point. Are there any decent particulars we could point to, or are tablets still too new on the scene? Rupert Murdoch’s newspaper, The Daily, created especially for Apple’s iPad and launched earlier this year, has had mixed results so far. The Daily has 120,000 “active weekly readers, 80,000 of whom are actually paying for the app, according to Publisher Greg Clayman,” reported Ad Age Digital recently. ‘The bigger number includes 40,000 non-paying readers on a two-week introductory trial period,’ Ad Age said. About 15 percent of those wind up subscribing, the publisher said. This is just the latest battle in an ongoing war. Media continues to try to monetize its online efforts and the reading public continues to scorn them. My fellow bloggers and I here on SixEstate have covered many of the skirmishes that have occurred so far. This is only the latest round. Consumers of news content want their news — and they want it for free. Image by Pew Research Center’s Project for Excellence in Journalism, used under Fair Use: Reporting.